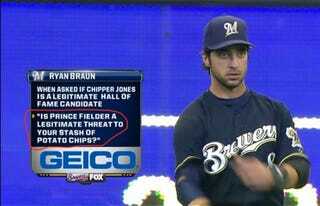 Our friends at Talking Chop spotted something strange during the Brewers-Braves broadcast Thursday afternoon. Not only did this quote seem unlikely from the mouth of a three-time All-Star, but it also seemed a bit too familiar: Talking Chop poster Bronn had responded the same way, to the same Chipper Jones Hall of Fame question, in the prior evening's game thread. Unfortunately, for those hoping Ryan Braun posts regularly on a Braves blog—or pilfers its Prince Fielder fat jokes—we have bad news. We called Kate Hart, Fox Sports South's Media Relations Manager, who was already investigating the matter this morning. She said later, "When producing a game, unfortunately sometimes mistakes happen. The graphic should have been attributed to Talking Chop." Well, that's no fun.